2016-07-13 - EPIC Night for Porter Pie! 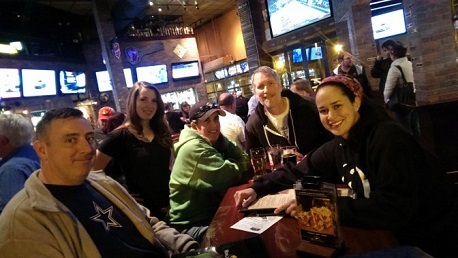 Wednesday was Epic Brewing Company night at the World of Beer Arlington, and the name was quite appropriate. Several new teams walked through the door just in time to get into the game that is becoming the best place to spend a Wednesday night in Arlington. If you don't believe me, you'll have to come check it out for yourself. The opening game saw a back-and-forth battle between the Mouseaholics and Quiz in My Pants. Hot on their collective heals, however, was the new team, The Martins and Porter Pie. After the appropriate bonus points for wearing the awesomely fashionable PubGuys t-shirt (they're only $15 and I'll give you 2 bonus points in each game) were handed out, The Mouseaholics had just edged Quiz in My Pants. In the Power Hour, as Davis from Epic Brewing Company was talking to each of the trivia teams about the great things they're doing at EBC, I was handing out more bonus points for simply drinking an EBC beer. We picked up a few new teams and charged into the second stanza of trivia. After a hard-fought battle, it appeared the final question, the PubGuys Kitchen Timer question was going to decide the winner. It's also worth mentioning that on this Epic night, the winner not only walked away with the usual WOB gift card but also an Epic Brewing Company electric sign. The sign alone was valued at over $100, so that final question was quite important.....dare I say, Epic? Apparently Porter Pie knows every member of the original cast of Saturday Night Live, and armed with that knowledge, they were able to overcome a deficit and leap to the top of the leaderboard at the end of the night. Finishing just behind was the powerhouse team of The Mouseaholics. Kyle will be filling in for me this coming Wednesday, so be nice to him....please. Now, for that bonus point. Be patient, this is a tough one. Find the 4th largest prime number under 50. Tell me the name of the city that has the airport which uses those initials for their airport.